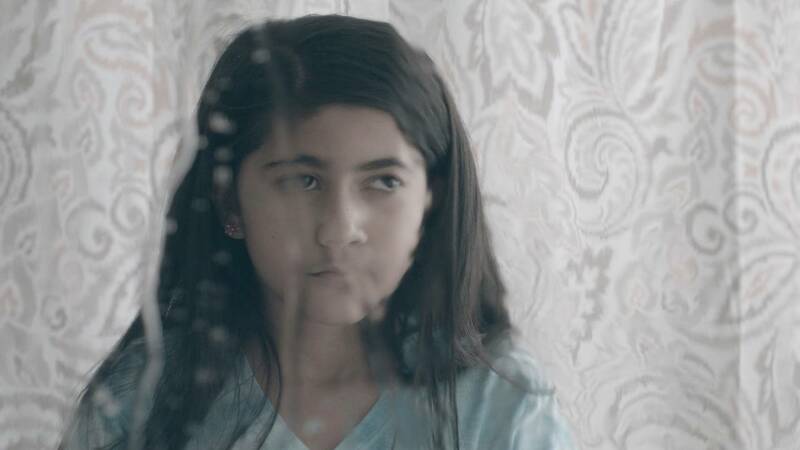 PBS spoke with Writer and Director Arpita Kumar, about the role water and technology play in the transformation of main character Maira's relationship with her mother. Arpita Kumar: While working on the cinematic look and the visual composition of the film, I was interested in showcasing Maira’s point-of-view. Children her age are often glued to screens. The rare moments they look up, it is because their attention is drawn to something new or otherworldly. Their glazed eyes become alive with wonder. We used water to create these moments of wonder for Maira’s character. Water also became a visual metaphor for the small transformation Maira would undergo through the film - from being icy cold to her mother to becoming fluid and empathetic towards her. PBS: Why did you want to use technology to introduce Maira to her mother’s abuse? Arpita: Technology has insidiously infiltrated our lives and for the younger ones amongst us — the digital natives — it is the new normal. They are born in a world where smart phones and internet are omnipresent and omnipotent. This is Maira’s world. However, her mother is a digital immigrant. She was born before the existence of digital technology but is an early adopter of it. Like many digital immigrants, she documents every aspect of her and Maira’s life on her iPhone but not all moments make it to her social media timeline. She carefully curates the fun or envy-evoking moments to showcase the half-truths of her world. The unshared videos or images then become increasingly dangerous because they hold her vulnerabilities. Keeping them private is of utmost important. "She carefully curates the fun or envy-evoking moments to showcase the half-truths of her world." I don’t think Maira is completely clueless about her mother’s abuse but she hides from it behind the screens of these devices. But when the ugly abuse is revealed via these screens, there is no escape - she has to address it. PBS: What was it like working with Aurea Jolly on this film, especially with the heavy theme surrounding the parents’ marriage? Arpita: Aurea is amazingly mature for her age and was an absolute delight on the set! While casting for the role, we auditioned several children and ensured that both the parents and their children were aware about the sensitive subject matter of the film. At the auditions, we narrated the story from the point-of-view of Maira to all the child actors. Aurea stood out in her audition because of her quiet yet powerful presence both on and off camera. She also had great onscreen chemistry with her co-actor, Ansuya, who plays her mother. During rehearsals as well as on the set, Aurea had brilliant ideas about her costume, her props, her performance, and about her blocking that led to a great collaboration. Without doubt, she has an excellent future as an actor!